Designed to optimize temperature regulation while biking, hiking, climbing or running, the Women's Comet Lite Cap Sleeve takes Icebreaker's strategically zoned lighter weight fabric that’s ideal for moving fast in warmer conditions. 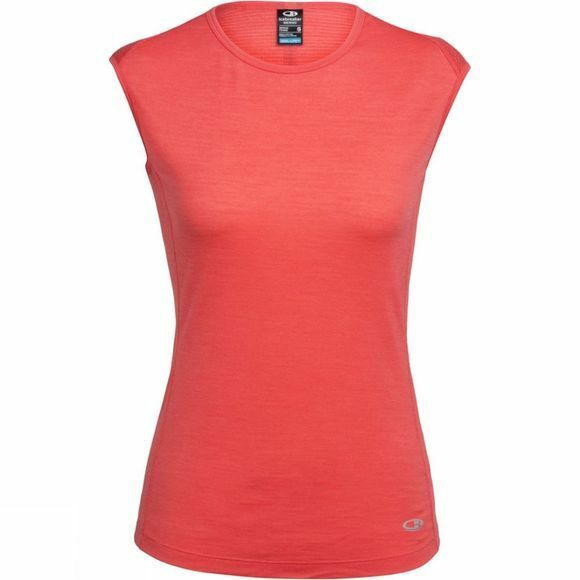 This highly breathable cap-sleeve tech shirt features 155g/m² jersey Cool-Lite fabric, which blends soft merino wool, natural Tencel and a touch of Lycra for stretch. The Comet Lite also features our corespun fibers, which use a nylon core wrapped in merino wool for added durability and strength that retains next-to skin softness. Strategically placed panels of corespun eyelet mesh amplify the shirt’s airflow, ensuring you stay comfortable during hot, high-output days.